Dimensions: 40" x 48" x 6"
The 40" x 48" Flo-Pallet is made of SMC...a highly-specialized and robust material used by the aerospace industry to lighten and strengthen aircraft...and in the automotive industry to lighten cars and trucks. A 40" x 48" Flo-Pallet has exacting dimensions. It will meet or exceed any specification and is in compliance with FDA standards. 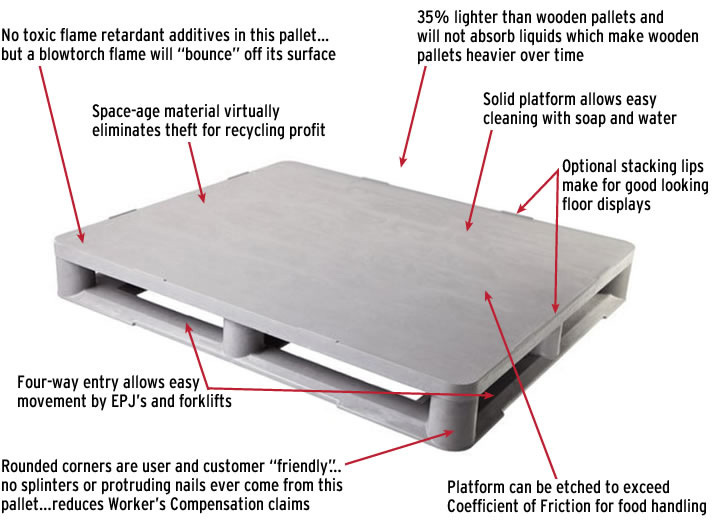 The 40" x 48" Flo-Pallet weighs just 50 pounds which makes it at least 30% lighter than wood pallet competitors. A Flo-Pallet is manufactured using SMC (Sheet Molding Composite). The glass content in the Flo-Pallet makes the plastic stronger, but lighter than traditional materials. Glass also gives the pallet hot and cold temperature ranges not found in traditional HDPE plastic pallets. A Flo-Pallet will maintain standardized dimensions throughout its lifetime. The Flo-Pallet can utilize any RFID technology, however, our exclusive global positioning system is readily available to track pallet assets electronically...not by hand-held scanners at choke points. • A Flo-Pallet will not embrittle at sub-freezing temperatures... even at 60 degrees below zero. • A Flo-Pallet will not become unstable at the highest temperatures...even at heat above 400 degrees. • A Flo-Pallet comes standard with flame resistant and self extinguishing properties...no additive or spray-on coating is required for fire retardant (FR) compliance.